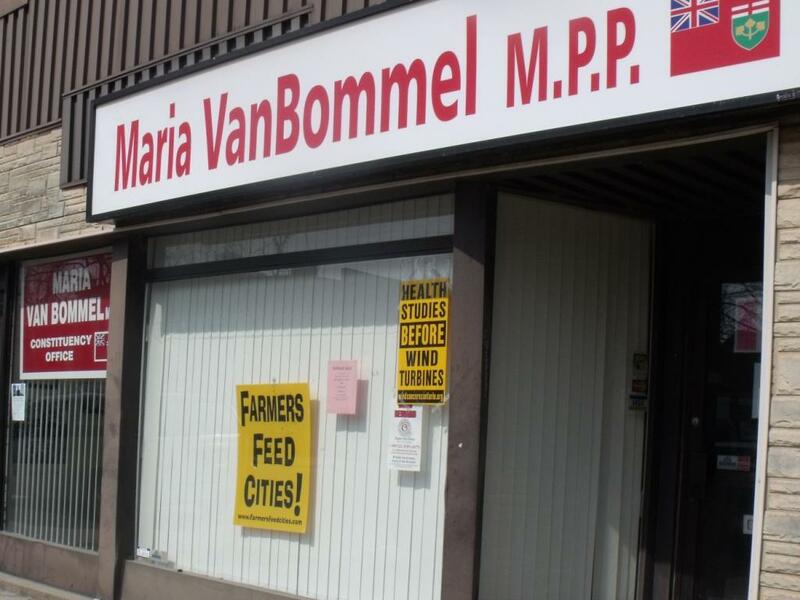 Van Bommel’s takes HER concerns to legislature, not ours. Mrs. Maria Van Bommel: My question is for the Minister of the Environment. Minister, climate change is something every government must deal with, and Ontario is no exception. The McGuinty government has already made great progress by shutting down dirty, coal-fired plants. I’m proud to say that in my riding of Lambton–Kent–Middlesex, wind, solar and bioenergy are playing a big role in cleaning up our air. But there are still concerns about our government’s approach to renewable energies. On Saturday, a protest rally marched to my office in Strathroy to ensure that I heard those concerns. The majority of them came from other parts of Ontario, but I was pleased to meet with all of them. They are very concerned about the scientific rigour behind our regulations for wind turbines. I made a commitment to those at the protest that I would bring their concerns to this assembly. Minister, has your ministry received any scientific evidence that wind turbines harm people’s health? Hon. John Wilkinson: I want to thank my colleague for the question. Let’s be clear: The answer to that question is no. We undertook a rigorous and thorough study when we developed our regulations. That’s why we have legislated in the province of Ontario a 550-metre setback, which is the toughest in North America. The Superior Court recently upheld all of our provisions, agreeing that we had reviewed and based them on peer-reviewed science and expert opinions. Dr. Hazel Lynn acknowledges in her recent report that windmills are “not that bothersome to most people” who hear or live near them. We even reviewed every report given to us by the Society for Wind Vigilance from their recent symposium. Not one report contained new peer-reviewed science about health effects that we had not already considered. Mrs. Maria Van Bommel: I know my constituents who are supportive of renewable energy will be glad to hear that wind turbines are safe. Some residents, however, are equally concerned about repeated musings by members of the party opposite about maintaining our use of coal. Ralph Ferguson, a former federal Minister of Agriculture, did a study in the Brooke-Alvinston area of my riding that clearly demonstrated the impact of dirty air on the high incidence of respiratory disorders and cancer rates in that community. Residents are willing to do their part to clean the air, but they want to know that the government is there as well. My question to the minister is quite simple: With many Tories still supporting coal-fired generation, will the McGuinty government continue to increase renewable energy so that we can eliminate coal from our energy mix and improve the environment of my constituents? Hon. John Wilkinson: Our commitment to renewable energy and conservation is stronger today than it has ever been. Why? Because we have the facts on our side. Posted on April 5, 2011, in Green Energy Act, Health, Ministry of Environment, Take Action. Bookmark the permalink. Leave a comment.